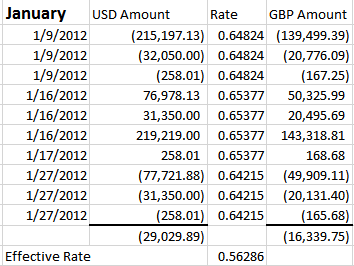 Rates entered in AX for USD to GBP that will be used by MR when doing currency translation. The report date is March 31st. 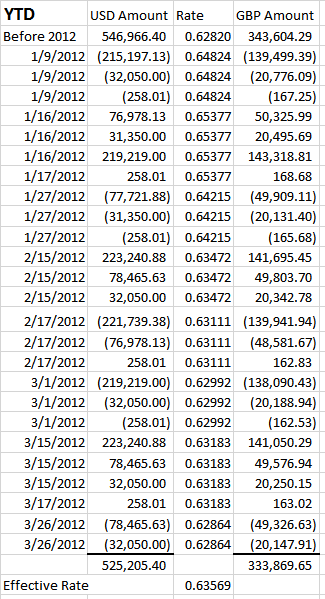 The columns are set to return YTD/BB data. 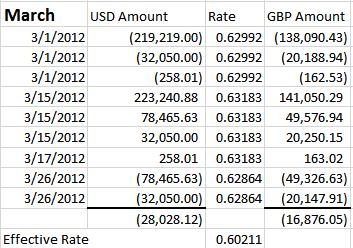 The data is from a transaction that occurred during 2011. The rate in effect at the time the transaction was entered was .62820. The report date is March 31st. The columns are set to return January data. Below is a screen shot of the report followed by the transactions that exist within January. The effective rate calculates to .56286. The report date is March 31st. The columns are set to return February data. Below is a screen shot of the report followed by the transactions that exist within February. 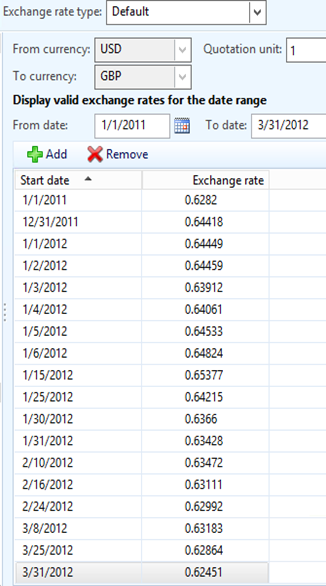 The effective rate calculates to .66524. The report date is March 31st. The columns are set to return March data. Below is a screen shot of the report followed by the transactions that exist within March. The effective rate calculates to .60211. The report date is March 31st. The columns are set to return YTD data. Below is a screen shot of the report followed by the transactions that exist within the year. 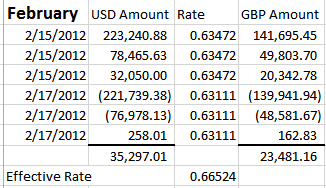 The effective rate calculates to .63569.